Are you ready to enjoy a fiesta? 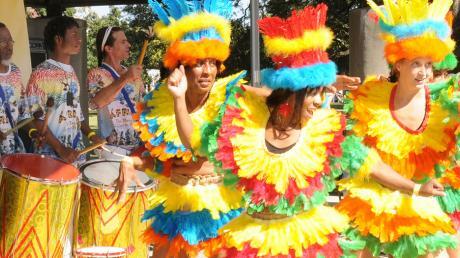 Sunday October 14th, 2012 the Audubon Zoo in New Orleans will be hosting the big celebration to honor Latina America Cultures & traditions. Live music, local Latina American Cuisine and children’s activities will be on hand for the celebration. What a fantastic way to introduce your children to a different culture and enjoy our beautiful simultaneously! The Audubon Zoo offers many beautiful animal exhibits from Larina America but now, your children can enjoy the culture that surrounds these animals in their natural origin. Local Artisans and community partners will be on hand to offer health, education, and social services will be available to offer information to guests if interested. Vamos a Celebrar! Let’s Celebrate!! If your interested in joining the fun, the free Festival activities are included in regular admission to Audubon Zoo, which is $16 for adults, $11 for children 2-12, and $13 for seniors 65+. But guess what? The Audubon Zoo has graciously offered my readers the opportunity to win tickets for free!! Before you put on your dancing shoes, read below for more information on the giveaway. Must be 18 years old to enter and available in U.S only. 2 Winners will be chosen using Random.org and drawn on October 17th, 2012 at 11:59p.m Central Time (I know, very quick, but I want to make sure you have time to receive your prizes in time for the celebration if you wish to attend). Winners will receive four (4) admission Certificates for One Adult (1) or One Child (1). Tickets are valid to ANY of the following locations. Audubon Zoo, Audubon Aquarium of Americas, Audubon Butterfly Garden & Insectarium in New Orleans, Louisiana. Tickets are valid through December 2013!! You will have plenty of time to use the tickets if you are not available this Sunday. Answer the following question by commenting below in the comment section of this blog post: What is your favorite animal at the Audubon Zoo? Like Audubon Zoo on Facebook Comment below letting me know you now like them or already are a Facebook Fan. Either way you get an extra entry. Follow Audubon Zoo on Twitter. Comment below letting me know you are now a follower on Audubon Zoo on Twitter. Share this giveaway on any other social media site. Comment below and let me know where you have shared the giveaway & a link. You can share on any social media site Once PER day PER site!! Tons of entries!! Good Luck & don’t forget to share with your friends & family!! Disclosure: The Audubon Zoo in New Orleans has provided me with tickets to facilitate this giveaway. All opinions are my own & can not be influenced in any way. Already a friend on facebook! Im a friend on facebook.my kids would love to go to this big adventure ..
My favorite animal is the orangutan. Love all the monkey’s at the zoo!!!! Facebook thats how we follow!!!! My favorite animal is the Sea Lions! My favorite animal at the Audubon Zoo is the tiger. I’d love to win! My favorite is the all of the Big Cats of course. My favorite Audubon zoo animal is the white tiger. I follow the Audubon Zoo on Facebook. I would love to win for the family! Liked Audubon Zoo On Facebook. wow, that looks like so much fun. My Favorite Animal At The Zoo Is The Monkeys. I Loove Them! My fave animal is the elephants! Would love to go!!! We love the monkeys I liked Audubon Zoo on Facebook. My favorite animal is the orangutans. Already like Audubon Zoo on facebook. My favorite animals at the zoo are the monkeys. The orangutans always put on a show–they’re definitely my favorite! Already a fan of the zoo. Already a fan on facebook.Love the Zoo,Aquarium and Insecterium!My daughter and I both love the chimps! Our favorite animal would have to be the Orangutans. Our favorite animal at the zoo is the giraffe!! I’m a fan of the Zoo on FaceBook now!! I love all the animals!! But my fav would jve to be the Monkey !!!! And also I like the zoo fb site!! My favorite animals at the zoo are the giraffes!! My favorite animals at the zoo are the giraffes!! I like Audubon zoo on fb! Just liked the FB page for the audobon zoo! Our favorite animal is the giraffe! I love to see tigers at the zoo! We love the giraffes! Thanks! I already like the Audubon Zoo on Facebook! Thanks! I follow Audubon Zoo on Twitter! Thanks! The orangutans are my favorite!!! Just became a FB fan of the zoo!! My favorite animals at the zoo are the monkeys. I could sit and watch them all day long. It amazes me how human like some of them are. I love the monkeys of course!!! My daughter and I both love the monkeys! I liked the zoo on Facebook. Thanks! We love the butterfly exhibit! The Orangutans are my favorite animal! The elephants Maelins! My favorite animal is the white alligator! Like on Facebook, and followed on twitter! The Orangutans of course! Already a fan also!